In 1965, Alfred Hitchcock released a movie called "The Birds" which depicts birds attacking people. This movie would prove to be one of the scariest ever made for people like me. I suffer from ornithophobia. A phobia of birds. I have memories dating back as far as I can remember about disliking, and being scared of, birds. I can recall once when I was at my Aunt's house and they had chickens, one started coming toward me and I screamed and hid behind my mother screaming that it was chasing me. That was the same day they cut the head off of a rooster that had been attacking the hens and other roosters, and had gotten out of hand. Could this experience when I was barely four years old have triggered it? Or was it something earlier? Was it something traumatic at all? Will I be able to remember it? 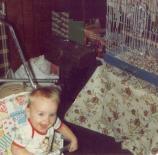 When I was a baby, my parents had a female African Grey named Pirate (pictured in cage on the right). From what my parents tell me, she had been with my father a couple years before he settled down with my mother, and this bird honestly thought my father was her partner. When my mother became pregnant with me, Pirate began to hate my mother, we can only assume it is because she felt my mother had "taken him from her." When I was born this bird would growl at me, it never bit me (that I know of) but to stay on the safe side, my parents decided it would be best to give the bird away when I was only a couple months old. It's quite possible that my fear of birds was a direct result of this negative exposure when I was so young. I don't really know when my dislike and fear turned into phobia, I used to be better about birds, although I never liked them. As a friend of mine recently reminded me, that I had a fear of them even while in 6th grade. We went to a school sponsored camp program called Chewonki. This camp required us to do all sorts of things, group obstacle courses, sleeping out in tents while there was still ice on the ground, and it all culminated with each of us pulling ourselves over a HUGE gorge on a rope (ok, a lot of precautions were taken, but it was still scary). And I was willing to do all that, even the gorge after some convincing. What wouldn't I do? I cringed at the suggestion of them putting birdseed on me and letting birds come up and eat it off of me. My sister even had zebra finches once, living in the same room as I was, and I wouldn't go near them, everything about them bothered me, and when they got out of their cage accidentally I'd hide under my blanket on my bed screaming until it was caught. I guess I noticed that my fear had turned into phobia after I moved back home after a summer with my aunt in Phildaphia following high school. 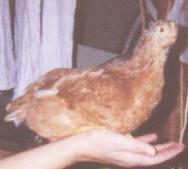 My youngest sister had a chicken for a pet in the garage. Now chickens have never quite been my idea of a pet, but I found myself almost completely unable to go into the garage while the bird was there, even though it was in a cage. I had to go into the garage to do laundry, but even a flapping of the birds wings would send me into a fearful panic. I did everything in my power to get my mother to get rid of the bird, and finally they agreed when the weather was getting colder and they would had had to move it from the garage. Whatever my decision, it gives me a perfect view for understanding phobias of other people. As easy as it is to laugh at how unreasonable these fears seem (like mine), we REALLY are scared of these things, and will go to extensive, sometimes foolish, lengths to defend our fears.